Found a biography of author E.B. Mann while looking for something else. He started his pulp career in 1928 with a story in Ranch Romances, went on to be published in the main Western magazines - Ace-High, Western Story, Wild West Weekly, Dime Western and Star Western. His pulp career ended in 1933 with about 80 stories published in the pulps, and 8 movies based on his stories. 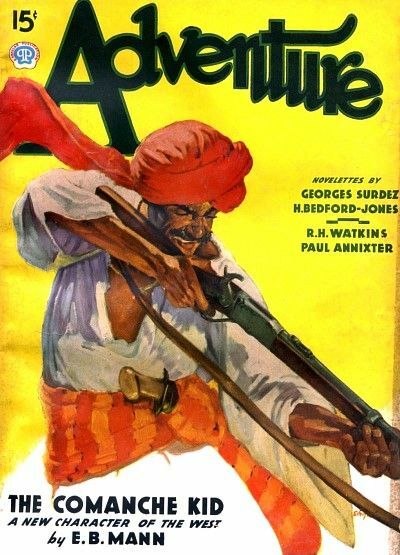 The following is biographical information from the Camp-Fire column in the Adventure, January 1937 issue where Mann had his only story but getting the cover nevertheless for The Comanche Kid. E. B. Mann makes his first appearance in our magazine—a new member of the Writers’ Brigade which has marched for twenty-six years and included most of the noted American men authors in its ranks. Mann lives in Florida. His story you will judge for yourself, and I hope you will like the people in it as well as I did. Mann makes this introduction of himself to the Camp-Fire circle. I would have said, if asked, that my life so far had been an interesting one. I’ve found it interesting, and amusing, and even—from time to time—exciting. Yet when I come to setting it down on paper it seems insipid stuff, like last night’s beer. . . . Perhaps it’s asking too much to expect a fictioneer to stick to facts! I was born in Kansas in 1902; was graduated from Decatur County (Kansas) High School in 1920, and for some time after that I traveled—mostly as a non-paying passenger—from Butte to the Brazos and to and fro. The trails my father had traveled in a covered wagon I traveled in boxcars and in Pullmans, working on ranches here and there, following the wheat harvest, wielding a billiard cue, setting type in various print-shops, earning a little, learning a little. I heard the lingo and the legends of the west from childhood on, and read omnivorously. I came to Florida with the birth of “The Boom” but I went to college while the other boys sold subdivisions. They made more money than I did, but they lost more too when the bubble burst. I had played football in high school and baseball afterward; in college, I played politics and found the game more fun, if not more profitable. I arrived in New York City in 1927 and within a month I knew men in scores of fine offices all up and down Manhattan Island. They had said, “No,” when I asked them for jobs. One gentleman finally said, “Yes,” and I became an advertising man. I sold my first story in March, 1928, and bought an overcoat. I needed it. Some six months later I said goodbye, with some regrets, to advertising and devoted all my time to the writing of the franker forms of fiction. Was married in 1928 to Helen Frazier Cubberly. Ambitions? To live pleasantly; to acquire a backhand drive; to shoot a shotgun as well as I do a pistol; to have a hand in the redemption of the western story from its past and present low estate. The photo in the article link shows what looks like an excellent pulp cover painting. I wonder which magazine it was used on?